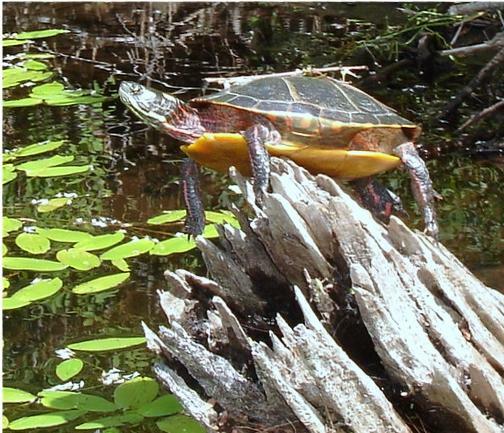 A turtle balances on a broken log submerged in the Royal River Reservoir. It was seen last July by canoeists making use of one of the two canoes, along with two kayaks, that are available for free at the Royal River Reservoir. The watercraft may be borrowed by New Gloucester residents only. If interested, inquire at the town’s public library. The 42nd annual New Gloucester Strawberry Festival will be held Thursday, June 29, from 6-8 p.m., at the Vestry Community Room of the First Congregational Church, 19 Gloucester Hill Road. Featured will be delicious strawberry shortcakes made with native berries from Pineland Farms, homemade biscuits and an area favorite – Hodgman’s Frozen Custard. Live music will be provided by the Berry, Berry Good Band. There also will be a baked goods table, sponsored by the members and friends of the New Gloucester Historical Society. Gospel singer Pastor Dave Mumford will perform at the New Gloucester Bible Church, 218 Lewiston Road, on Sunday, June 25, at 6 p.m. Mumford hails from Topsfield, and he performs throughout New England. He has recorded several CDs, which will be available for purchase. Everyone is invited and an offering will be collected to help defray his expenses. A public reading of the Declaration of Independence will be held on Tuesday, July 4, beginning at 9 a.m., at the New Gloucester History Barn, 383 Intervale Road, located behind Town Hall. This event, which is free and open to the public, is sponsored by the New Gloucester Historical Society. Come to the New Gloucester Public Library, 389 Intervale Road, and enroll in the Summer Reading Program. The program’s goal is to read (or, for little ones, to listen to) a total of 3,960 books. Sign up during library hours now through Saturday, July 8. All ages are welcome to participate – from babes in arms to Great Aunt Gertie. The program wraps up on Tuesday, Aug. 22. Join in on the fun at Pineland Farms’ Produce Division, 752 Mayall Road, New Gloucester, for ‘Strawberry Day!’ from 10 a.m.-1 p.m. on Sat, July 8. This agricultural education programming event features complimentary family activities including a strawberry-themed scavenger hunt, face painting, and ice cream. The rain date is Sunday, July 9. For more details, contact the Education Department at 650-3031 or education@pinelandfarms.org. The New Gloucester Public Library is offering passes to Maine Wildlife Park, Boothbay Railway Village and Sabbathday Lake Shaker Village. It also has passes available to most state parks, excluding the Allagash Wilderness Waterway, Penobscot Narrows Observatory and Scarborough Beach state parks; these are day passes that cannot be used toward camping. All town facilities will be closed Monday, July 3, and Tuesday, July 4, in observance of Independence Day.